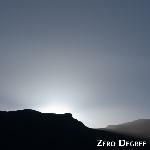 After two CD releases and one netrelease so far, Zero Degree is one of the most active projects on audiophob. With "Aufbruch" the project shows yet another musical side. Not as rhythmic as the last release "The Inner Realm" it is still playing with long synth patches and is moving more into dark ambient drones.